Elise Gould of the Economic Policy Institute finds that American households are working longer hours — hours they used to have for other activities such as leisure or family time. These longer hours are the main reason why household earnings increased over the last 35 years. – Between 1979 and 2007, annual earnings of most households (those between the 20th and 80th percentiles of earnings) increased by 15.2 percent, rising to just under $60,000 by 2007. – During this period, the average hourly wages of these households grew $1.05 per hour, while annual hours rose by 289 hours. The figure above shows the majority (61 percent) of the rise in annual earnings of middle-earning households was due to increasing annual hours and not increasing wages. Less than half (only 39 percent) of the increase in annual earnings was due to increasing hourly wages. 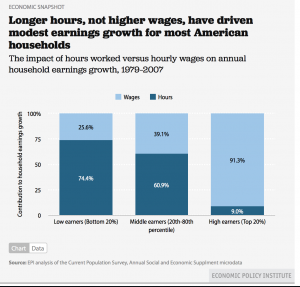 For lower-earning households, increasing annual hours contributed nearly 75 percent to increases in annual earnings. Meanwhile, households at the top experienced the reverse phenomenon: for them, increasing hourly earnings explained over 90 percent of rising annual earnings. So that there is no concern about cherry-picking endpoints, it’s useful to note that if we examine the full period (1979-2013), the meager rise in annual earnings for moderate-earning households is driven even more by increasing hours, as opposed to increasing hourly wages. During this period, increasing hours contributed 74 percent to annual middle-earning household earnings, while hourly earnings only contributed the remaining 26 percent.